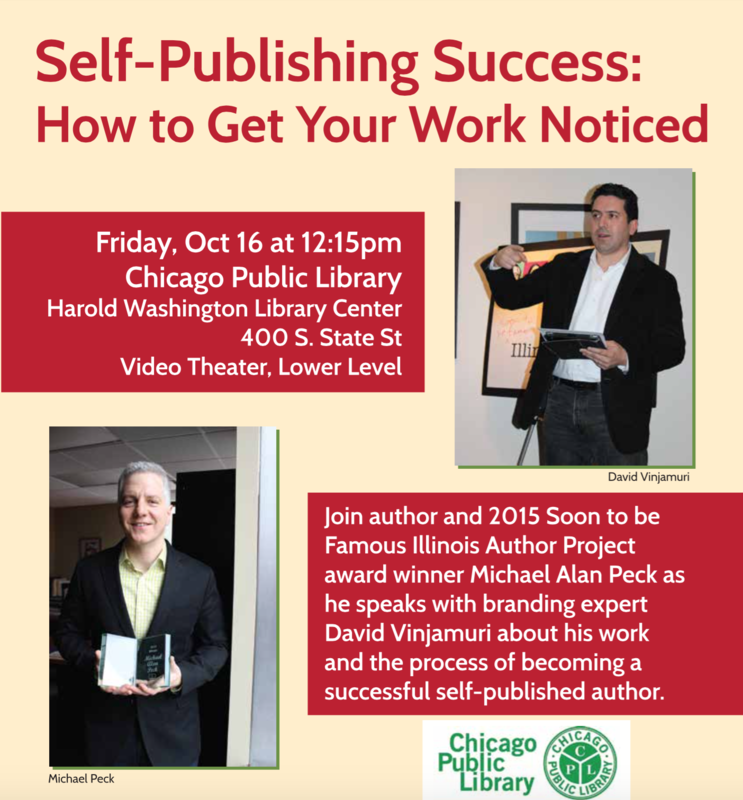 October 5, 2015 (Chicago, IL) – The Chicago Public Library announced today that it will be hosting a discussion with Michael Alan Peck – winner of the 2015 Soon to Be Famous Illinois Author Contest – and branding expert David Vinjamuri on October 16, 2015 at 12:15pm. Not only did Michael win the Soon to be Famous Illinois Author contest, but he also represents a new brand of author, one that wants to retain ultimate control of his work. After Peck wrote the compelling award-wining book “The Commons,” he did not seek a traditional publisher. He retained control and sought out professionals to assist him with the traditional publishing work. Michael Alan Peck won the Soon to Be Famous Illinois Author Contest for his contemporary fantasy novel, The Journeyman. The Journeyman tells the story of three people who board a bus and – following a horrific accident – must band together as the last hope for the afterlife, known to them as The Commons. As an author, David Vinjamuri writes both fiction and nonfiction. His works include Accidental Branding: How Ordinary People Build Extraordinary Brands, Understanding Self-Publishing, Operator (Michael Herne Book 1), and Binder (Michael Herne Book 2). Michael Alan Peck will speak with David Vinjamuri about his work and the process of becoming a successful self-published author. The Soon to be Famous Illinois Author project, now in its second year, is the brainchild of library marketing professionals who were inspired after listening to a presentation by brand expert and NYU professor David Vinjamuri. Vinjamuri spoke at the American Library Association’s 2013 annual conference about the importance of libraries in the era of e-books and self-publishing. He challenged libraries to wield their collective influence to lift a self-published author to success to create a measurable indicator of the power of libraries and librarians to affect books and reading. This project received the prestigious John Cotton Dana Award by the American Library Association in 2015. For media inquiries, please contact Kelsey McBride at Book Publicity Services at (805) 807-9027 or kelsey@bookpublicityservices.com.